A hack that eases the entry level curve for new players, as well as some changes that even veteran players can enjoy. Text is a lot faster. Camera has been fixed, now more centered. Pressing the select button toggles between Hyper and Jump shoes if you have any of those. Start button goes to the map screen. Pausing has been removed. 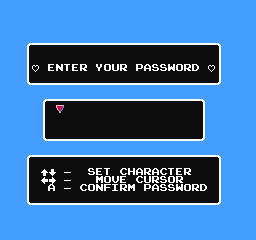 Better password screen with more information on controls and also way more intuitive controls (see screenshot). 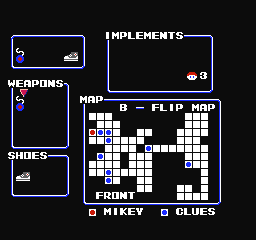 New map screen showing the location of some important items. The player is still left wondering what those are and how exactly to get there anyway, so it actually works like a loose guide. It could seem like it makes it too easy, but in the end that is definitely not the case. 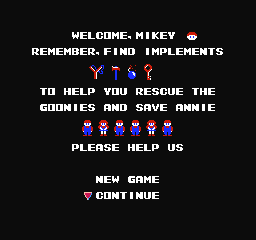 The “start/continue” screen has been redone with quick guide and plot setting. Cannot move the hand or the hammer when hitting in rooms. Just use the item and if there’s something to appear, it will. Rearranged the health on the HUD. Only need to hit the lady once instead of five times. A lot of the games from my childhood were fun but needlessly difficult or strange controls. 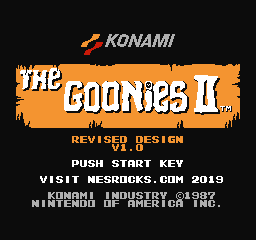 This is one that is fun to play through but hunting for items is a chore. This hack marks the items on the map, not saying what they are, so not as much hunting. The game is still enjoyable to play but this makes it much more so.